Jim Henson's Fraggle Rock Omnibus review: An essential collection for fans – AiPT! Rediscover the wonderful world of Jim Henson’s iconic television series Fraggle Rock in this definitive collection of tales from some of the most imaginative minds in comics. My favorite pages of this entire, massive book are simple: the completely yellow pages that bookend with the words “Dance your cares away…” and “…worries for another day.” Just reading those lines lifts my spirits. The hundreds of pages in between those words hit a spot that combines nostalgia with a sense of childlike wonder. Fraggle Rock first premiered in 1983, years after Jim Henson’s The Muppet Show featured Kermit and his gang of weirdos trod the boards in their insane variety show. In a radical departure from the previous format, this show would explore the world of tiny creatures that inhabited our world right under our noses, not truly understanding what we were, but exploring in their own childlike, alien way. They lived in harmony with each other and the industrious little green construction workers, the Dozers, whiling away the days on artistic pursuits and discovery. 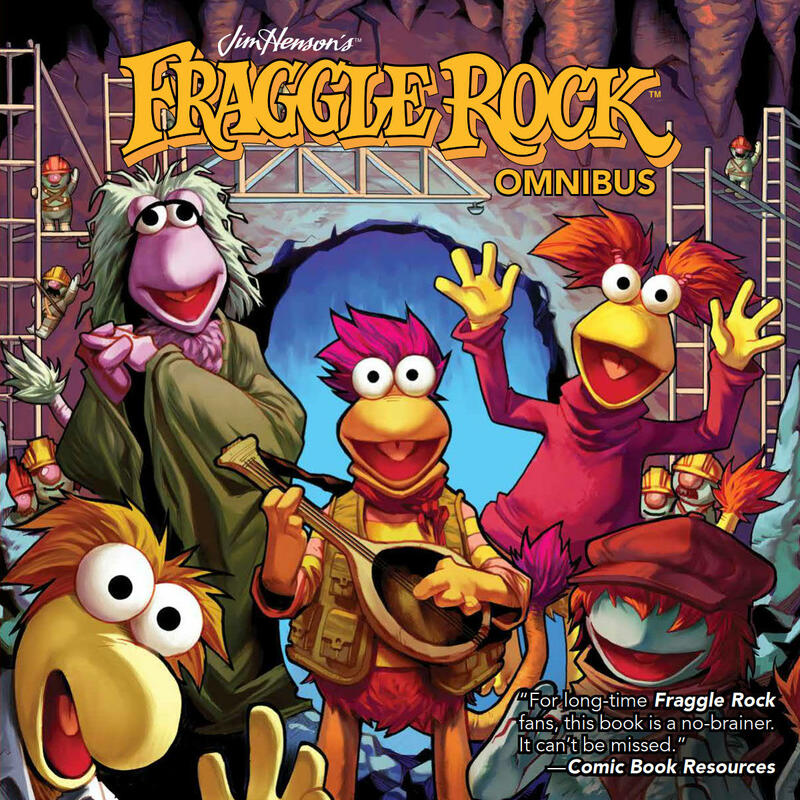 The Omnibus collects twenty Fraggle stories illustrated by a number of different artists in a variety of styles. Included in the tales are moral lessons, friendship, love, and all the characters we’ve known for 35 years now: Red, Gobo, Boober, Mokey, Wembley, the Trash Heap, and more. The common thread throughout is what has made Fraggle Rock such a long-term success: caring for one another. As the introductions by puppeteers Karen Prell and Dave Goelz illustrate, Fraggle Rock was always more than just a TV show. It was the heart of Jim Henson himself displayed proudly on screen. He shared joy with an entire generation, and the Fraggles continue to do so today. This Omnibus is a collector’s dream, bringing together so many stories and artists to create exactly the kind of stories that would have made Jim proud. Fellow Silly Creatures, this is an excellent collection that will make you and the next generation of Fraggle fans smile, learn, and love. Just like Jim wanted. What else does there need to be? How bout intros by Dave Goelz and Karen Prell? If you're looking for bad things about a Fraggle Rock book, you're looking in the wrong place. Try the Gorgs.